Posted on March 26, 2015 at 9:30 am. Disney almost certainly has a crack team of artists working for them. And I’m pretty sure after re-watching The Little Mermaid that whoever’s in charge of artwork over there had a pretty extensive education in art history as well. 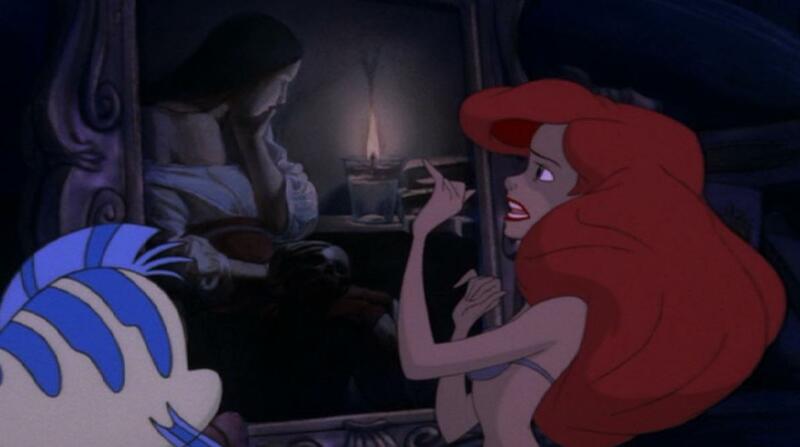 And this viewing is what led to my quest to unearth just how much Disney relies on art history, starting with the mystery painting in The Little Mermaid. Here’s what happened. I was watching The Little Mermaid, casually singing along to “Part of Your World” like anyone else would, not expecting my life to be changed in any huge way. But then I saw it. This painting. Right here. When Ariel sings “What’s a fire, and why does it/What’s the word? Burn?” For my entire childhood I thought that it was just a random painting that Ariel had found chilling in the ocean somewhere. But now I realized…I had seen that painting somewhere before. It’s a real painting! I tried Googling, but nothing really came up at first (I used pathetic search keywords). Since I wanted to finish the film, I put my quest aside for a while to focus on other, more relevant quests (like getting groceries and filing taxes). But then last week I was flipping through my art history textbook when—miracle of miracles—I saw the painting. There it was, casually loitering between the pages, just waiting for me to find it! And now, after I had pushed my quest to the back burner, I had all the answers I needed. There must be a reason. Here’s what I found out. The painting by French artist Georges de la Tour and is titled Magdalen with the Smoking Flame. It was painted circa 1640 and features Mary Magdalen, dramatically drenched in candlelight, staring into the candle’s flame. On her lap sits a skull, and she’s wearing a billowy white and red dress tied with a rope (much like Ariel’s dress made out of sails when Eric first finds her by the ocean). It’s traditionally thought that the skull on the Magdalen’s lap is a reminder of mortality (known as memento mori in fancy Latin art terms). While often reflected by a skull, candle, or flower, it’s common in some 17th-century traditions because it contrasts the eventual fate of all humans but not the work of art. So why put a painting like this in a children’s movie? Well, the Magdalen definitely looks like she’s meditating on the mystery of life as she stares at the smoking flame. And isn’t Ariel doing some serious thinking during “Part of Your World” about what it would be like to be a human? They’re both considering some serious thoughts about life, and perhaps that’s why this painting was included. Or, on a lighter and more practical level, the animators and songwriters probably ran into the tricky little problem of how Ariel could ponder what a fire was while she’s clearly underwater. Either way, the painting adds a little art history in-joke to the film and leaves people like me wondering just how extensively Disney artists are trained in art history? 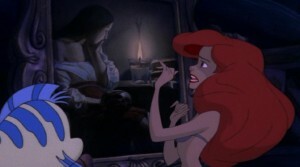 Have a better thought about why this painting might have been included in The Little Mermaid? Leave us a comment! And share this post with all your Disney-geek friends! Just for fun: watch the whole “Part of Your World” sequence here! I wrote an Art History paper on this painting in college many years ago, and then my daughter, on a high school trip, brought me the print from the Louvre. Later when she watched the movie with her friends, they saw the painting and said “That’s your mom’s painting”. I love all the connections and now finding this post. Thanks for the link to the Disney sequence on YouTube.